Lewis Carroll's photographs of the girl who inspired Alice's Adventures in Wonderland will go on display alongside images of her as an older woman. They will be shown in the National Portrait Gallery exhibition Victorian Giants: The Birth of Art Photography. 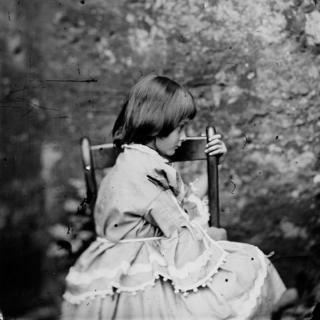 The Oxford academic photographed his neighbour Alice Liddell, daughter of the Dean of Christ Church, as a girl. Years later she was photographed by him again, as well as by Julia Margaret Cameron whose work is also featured. Carroll's fascination with Liddell, who died aged 82 in 1934, has been the subject of speculation. Phillip Prodger, the show's curator, said: "Much has been written about the relationship between Carroll and Alice. "We will never know exactly how Carroll himself felt about his subjects, and there is no doubt he developed deep personal attachments with many of his sitters. "Nevertheless, Carroll nearly always photographed his children with their parents present, and no claims of impropriety were ever made in his lifetime. "For Victorian artists, children represented the blank slate of humanity - the potential to experience pure thought and feeling before the corruptions of modern life intervened." The images of Liddell as a girl come from the gallery's own collection, but have only rarely been on display. The exhibition will also feature portraits of Julia Margaret Cameron (1815-79), Oscar Rejlander (1813-75) and Lady Clementina Hawarden (1822-65) as well as Carroll (1832-98). The exhibition runs from 1 March to 20 May, 2018.